unfortunately, most problems with the other 2018 cascadias still exist within this one. For example, the lights above the windshield that are supposed to be amber, are still white. There are very little exhaust pipe options, not many realistic fender options, still only the 6×4 chassis (which just doesnt even work with the daycab option), the rear tail lights are very dim, and the shadows are still messed up. However I do think that the texture for the truck is perfect. Would be good to see these issues addressed. Dude, fix your link. It’s broken! When I go to download the file it says “NO FILE”! Please upload it on another website (e.g. mediafire or mega.co.nz). Dude, get wise. That’s sharemods’ way of saying TRY AGAIN LATER. Happens when too many people want to acquire it at the same time. @Felipe Conbar, Have you all released a 4.5 version of this Truck Mod? It’s on “modland site” & it Crashes the game after you buy it when you start to drive it out of the Dealer lot!! Just checking to see because this one does work! Thanks. San Francisco, California, Tucson, Arizona and Texas. Biggest piece of crap mod. Why can’t there be a modder that actually takes pride in their work and makes sure there are zero errors before releasing it? There are zero 2018 Cascadia truck mods worth anything. 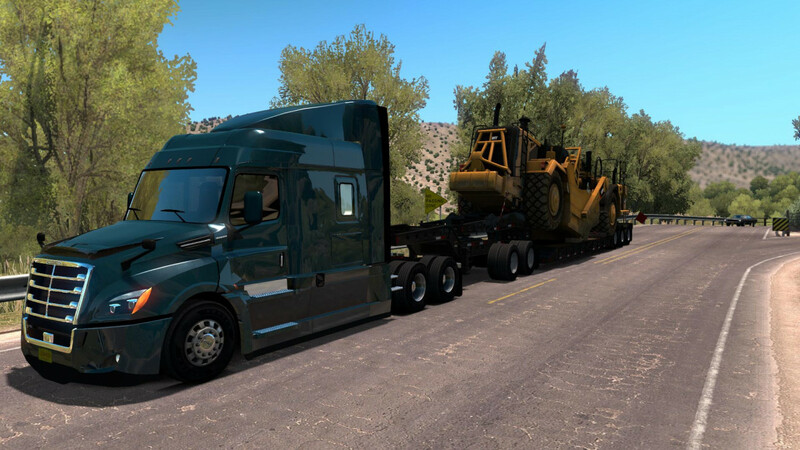 You have a Mod Conflict then, I run quite a few Mods & I have Had “NO ERRORS In the Log” from this Truck Mod, The BEST 2018 Cascadia to date!!! Thanks Guys!! Nope, the truck was the only mod activated when testing. Well, the truck and Habdorn’s CNG trailer. Those were the only two mods activated when I was browsing the truck through the truck browser. Also, taking a look in the texture folder within the mod, and looking at the referenced mat file, the file names in the mat are not the same as what’s in the texture folder. For example: /vehicle/truck/upgrade/frente/cascadia_2018/textures/lights_mask.004.tobj does not exist within that folder. There is a light_mask.003.tobj, and the game is also expecting a “texture_name : “texture_nmap”” for what I assume is a light on the truck. I’m assuming you don’t have the mini console activated while testing parts in the game to make sure there’s no errors? 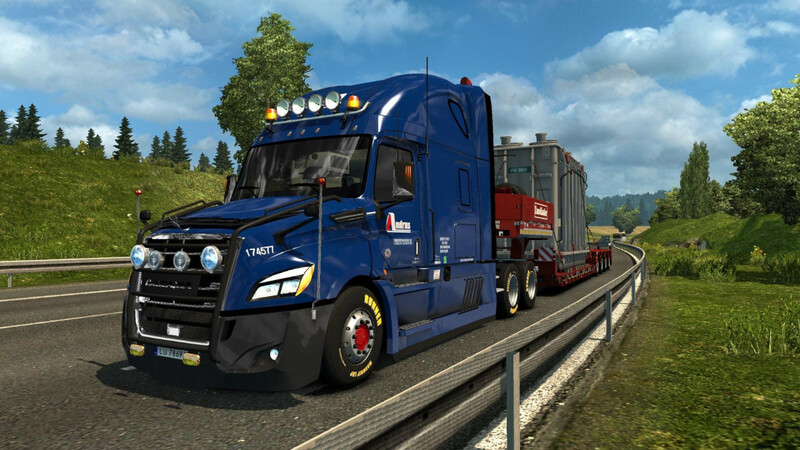 @Felipe Conbar, HAVE YOU GUYS UPDATED THIS TRUCK MOD TO 4.5.1? IT’S ON ANOTHER MOD SITE & IT CRASHES! SINCE IT WASN’T ON HERE I THOUGHT IT MIGHT BE FAKE! IF IT’S “NOT” YOURS PLEASE LET US KNOW!!!! THANK YOU! Sent Tom a link to this truck where I fixed as many things as possible (mostly adding the missing stuff from ETS2). Asked him to share it with you so that you can probably fix the other stuff that I mentioned to him. I believe I have it down to a total of just 5 errors. Dude, really, is it that hard to upload your mod on another website?! It’s almost 2 days and the sharemods website is still saying that there is NO FILE at that address! No matter what browser I’m using! Works Fine for me I just checked it on 3 different Mod sites, You must have something else going on dude! Thank you, I downloaded this last night but was too busy driving it to leave a comment. This is a beautiful truck and drives great. I have a ton of mods and it doesn’t seem to conflict with them. It may not be 100% perfect but it will do nicely until perfect gets here. The imperfections that I noticed are very nit picky and are more of a wish list for changes then an imperfection. Other versions I’ve tried really were undriveable. Thank you for this awesome version. downloaded from other site and tested. Much faults and things without function. I was having the problem of “No file” when trying to download this truck. But I remembered that it’s been awhile since I have cleared my browser history and all. After doing this, I went back to download this and it worked. I have the file in my mod folder. This may or may not work for those of you. Give it try of clearing browser and see if the link works for you. Better NOT download the 4.5 & 4.5.1 Update that’s on Modland site, They just LOCK up your Game before you can leave the Dealer! !